Since the day Ava was born, there hasn't been a dull moment. From the moment we found out our daughter had multiple CHD's and would need a series of three corrective, life threatening surgeries just to have a chance to live, I have been in a perpetual state of worry/alert. Now to those of you living with a "normal, healthy" child, this may alarm you. But for those of us with children born with a few extra needs, well you know exactly what I am talking about. Let's not sugarcoat how life is as a parent to a child born critically ill, it's years upon years of constant worry, fear, learning, memorizing, scheduling, organizing, did I mention fear and worry? You bet! ...Moments such as simply watching your little girl run and play and (almost) keep up with an oh so slightly older kid. Better yet, check out that mega watt, ear to ear SMILE on her little face. Moments like this make me truly realize how very lucky WE are to have been blessed with Ava. Enjoy it baby girl, you have more than earned it! Sigh. I guess Ava felt left out? She mistook a hospital stay due to illness as a "milestone" she needed to meet? But really baby girl, did you have to catch both(supposedly) at the same time? Did you really have to have respiratory distress mommy hasn't seen since your first few months? Months that were filled with words like CPAP, CPT, breathing treatment, lung disease, etc. You know Ava, she goes big. SO, Tuesday afternoon we went to the park with some close friends. Ava was super excited ALL morning to see her friends, especially "Loogie" which is Ava's way of saying Logan. Bouncing off the walls, driving mama bonkers until it was time to go. We get there, she's playing but rather suddenly gets super clingy and kind of just looks done, drained. Probably an hour later we are at home and Ava falls asleep so fast. Now if you know Ava you KNOW this girl NEVER slows down to nap unless she's sick. She wakes up probably 2 hours later and has a temperature and a cough/pretty bad runny nose. We treat the temp as needed and keep an eye on diva. Next morning, more temp, more cough, more snot. Crap. :( Ava takes another nap that day and her appetite is definitely decreased. I continued to keep a close eye on her, but really it just seems like a bad cold so I am not too terribly concerned. During that night and into the next morning, Ava starts breathing rapidly. We didn't get much sleep that night, making sure she was okay. The next morning when she wakes the temp is finally down, she is happy and more like her normal self so we are thinking YAY! Then she falls asleep and is asleep for a LONG time. The breathing starts getting worse, and I notice she starts retracting. 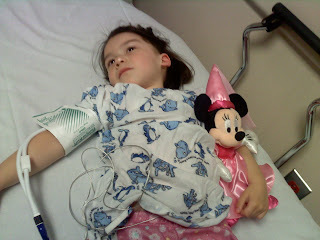 So that evening we take little miss into the local children's hospital ER. We got a bed in the ER rather quickly, which was impressive. 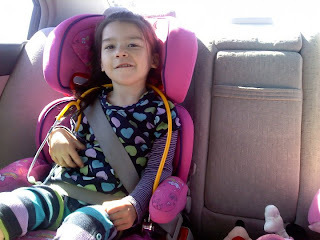 There we go through the usual questions, and the OH MY's explaining Ava's cardiac history. Overall I am extremely impressed with the ER and the staff there. They got her in right away, asked all the right questions without too much repetition, and started tests immediately. The only thing that really angered me, was the IV situation. It just should NOT take 6 blown veins and 8 pokes to get an IV. I realize she has lots of scar tissue(please don't comment on how you can tell she's been poked quite often nurses, it only brings back terrible memories and feelings), she was dehydrated and "heart kids are always hard pokes anyways." It's no excuse to treat a child like a pincushion. If you aren't confident you can get it, PLEASE call someone more apt to do it. Don't sit there and poke and prod on a small child who is very alert and already terrified, it's extremely traumatizing for them and anger-inducing for their parents. After way too many tries, I told them they needed to be 100% confident or back off before poking again. They called in the transport team who got it in 2 pokes. Usually they get it on the first try. Word to the wise and something for mom to remember next time, have them call transport FIRST. Not only did they get the stick quick, but they were HONEST with Ava. They TOLD her it was going to hurt, but that it would be brief and let her know WHEN they did it. No surprises, which actually helped. And afterwards, they gave Ava stickers. When you're 4(basically), and obsessed with princesses, an Aurora sticker makes EVERYTHING better. Loved them. We got a bed up on the good ol' 7th floor, in the good ol' East PICU. Yuppers. The exact place Ava spent just over 2 months of her life before coming home for the first time. And yup, she still always has over a handful of nurses that remember her and are amazed at the little girl that failure to thrive, barely 8lb, 3 month old baby girl turned into. :) In fact, our first night there Ava had the same night nurse she had VERY often on her first stay, the first nurse to receive a smile from Miss Ava, Michelle. So nice to see her and know what great hands Ava was in. Later doctors come by and tell us that Ava is all clear, her white blood cell count is normal, which means no infections! And again someone is saying that they don't think that little tiny "questionable area" is pneumonia and that we should be good to go home the following day. There was some drama, but I honestly just don't want to go down that road again. This hospital just again proved why I will always be a nervous wreck and on my toes watching and double checking every one's every move when it comes to my daughter and that place. Never fear going over heads and questioning. Not only is it your right, but it's pretty much your JOB, especially for those of us with "special needs" children, though I really dislike that label. Thank you to everyone who was there for us, even if it was just through sending me encouraging messages, emails, etc. Especially to my dear hubby, who seriously still amazes me with how committed he is to his children and family. Those who helped watch Gregory, helped me get to the hospital, those who offered to keep us company, feed us, etc. YOU guys help me more than I can ever express, and I am truly thankful to have so many people who care so deeply for my girlie. Ava started private speech therapy last Friday, and is still going to her preschool class two times a week. Speech went great. Her therapist was very optimistic and excited to be working with her, again. :) She said how she can hear all the words forming from Ava, and that she will work on further concentrating on Ava's muscle tone in her lips and tongue, there are certain stretches you can do with the face to help "wake up" the muscles and get them working even while at rest, as well as prompt them to move the way they need to in order to make certain sounds. As far as cognitively though, she was thrilled with what she saw and said it's "all there, and once Ava gets going there is going to be no stopping her!" Ahh, music to this heart mamas ears. Right now Ava's school and speech's schedules aren't meshing very well, at ALL. But we have her in for once a week as of right now, hoping for more along the way and definitely over the summer when Ava will be out of class. We are still working on referrals for GI(it's been a LONG time since she needed one) and a speech pathologist the ENT recommended to address her possible palate issues I covered in a previous blog. Sorry for the sporadic postings. I am trying to get back into the habit of posting weekly, if not more often! Have a great week everyone!